Crane’s boat Monterey was one of 21 boats participating in the Antigua-Bermuda Race, a 935-nautical-mile event filled with serious sailors headed for the promise of a Bermuda landing. Monterey was about 220 miles from the island nation when that plan was foiled on May 17. Monterey wasn’t some clunker staying afloat with help from duct tape and tubes of boat caulk. A 2000 Farr PH 56 center-cockpit sloop, she had been diligently maintained for the past 14 years by Crane. The other five sailors aboard—Cam Macrae, Jock Macrae, Bob Medland, Kit Tatum and James Watlington—had decades of bluewater experience among them. The race is known to be a particularly fun event in which boats are allowed to use their engines, but it was to be especially enjoyable aboard Monterey, with her seaworthy construction, high freeboard, excellent sailing capabilities and unblemished 40,000-mile track record. 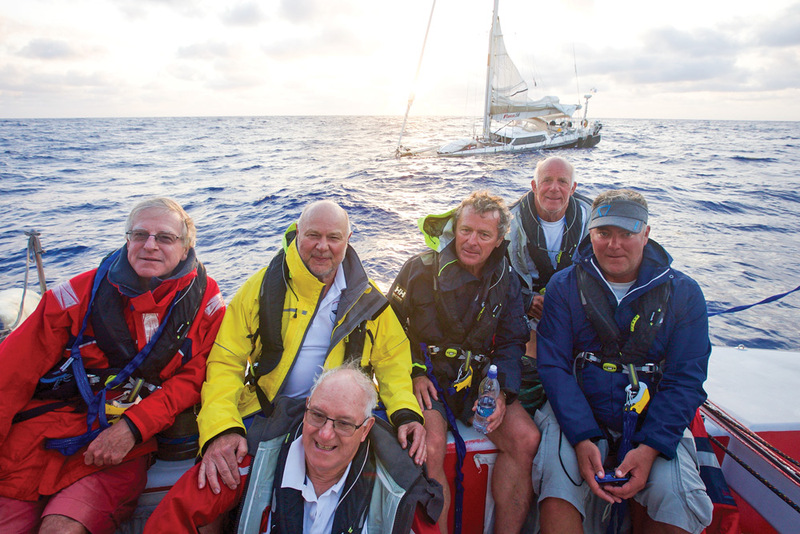 Les Crane, left, and his crew watch his Farr 56 Monterey as it sinks in the Atlantic Ocean. Crane had been on deck earlier in the night. Around 2:30 a.m. the engine was switched off and Crane checked the weather. Monterey was beating into 10 to 15 knots, the wind just forward of the beam, and moving along nicely at 7 to 8 knots. By all accounts, the wind and sea state was comfortable. “It was a beautiful night,” Crane said. At 4:15 a.m., shortly after discussing the strange noise, the skipper went to investigate and was surprised to find the forward head flooded. Monterey was on a starboard tack, so Crane called out to the helmsman to “stand the boat up.” The adjustment in sail trim allowed Crane to open the seacock in the head and pump out the water. The seacock had been closed as a precaution because it submerges on a starboard tack. The sight of seawater flooding the compartment left him concerned. “I thought I better have another look around,” he said. The skipper alerted the entire crew and ordered them to start closing seacocks. He had a laminated boatbuilder’s lines drawing with the location of the 10 seacocks below water level highlighted. The boat had another 10 seacocks or orifices above the waterline, which were shown on the drawing. However, the seacocks on the drawing weren’t numbered, which caused some confusion. To further compound the situation, the fonts identifying the seacocks on the drawing were newsprint size and difficult to read for those requiring prescription eyeglasses. Water continued to enter the boat, weighing down the bow. Despite their search, the crew was unable to locate the leak. The crew of Monterey, safely aboard Esprit de Corps IV, pose for a photo as Monterey goes down. “We were in a race so other boats were around,” said Crane, noting the boat’s AIS transponder and the YB tracker showed which vessels were close by. The Canadian boat Esprit de Corps IV was about four miles astern, skippered by Gilles Barbot. The race flagship Spirit of Bermuda was eight to 10 miles back and Challenger about 20 miles behind. Monterey’s primary radio antenna had malfunctioned in Antigua but there were portable VHF units aboard, although the latter would have significantly less transmission range. The first radio broadcast from Monterey was an attempt to contact Esprit de Corps IV. “I wanted them to come alongside,” Crane said. Tatum made the broadcast but got no response. Ten minutes later, Crane broadcast a mayday. Water was still gushing in at a rate that told Crane the problem wasn’t simply a broken one-inch diameter hose or small hull crack. “Monterey is 16 feet wide. There’s a lot of volume in this boat,” he said. Barbot steered toward Monterey, not knowing the nature of the emergency, only that help was needed. It could have been a man-overboard, a fire, a crew injury, or any number of critical situations. Back aboard Monterey, conditions were worsening. “The water was coming in faster than it might from a broken hose. By this time, there was 3 to 4 feet of water in the bow and the boat was bow down,” Crane said. The skipper ordered the crew to prepare the Switlik life raft for deployment. “I was very concerned about becoming trapped in the boat upside down,” he said. Crane hailed Bermuda’s Rescue Coordination Center on the boat’s registered satellite phone, which automatically identified the caller as Monterey. “They hooked us into the U.S. Coast Guard,” he said. Monterey was also equipped with an EPIRB, which sent out a distress signal and the location of the device. At 5 a.m., Crane gave the order to abandon ship. The sun had not yet edged over the horizon. Watlington later told the Montreal-based daily newspaper La Presse the water was up to his waist in the galley as he moved toward the life raft. The life raft splashed and inflated, but was upside down. The sailors hauled on the painter and horsed the life raft to where it could be righted and secured to the transom swim platform. The six sailors hunkered in the bobbing raft, awaiting rescue. The sea was choppy but at least the water was warm. 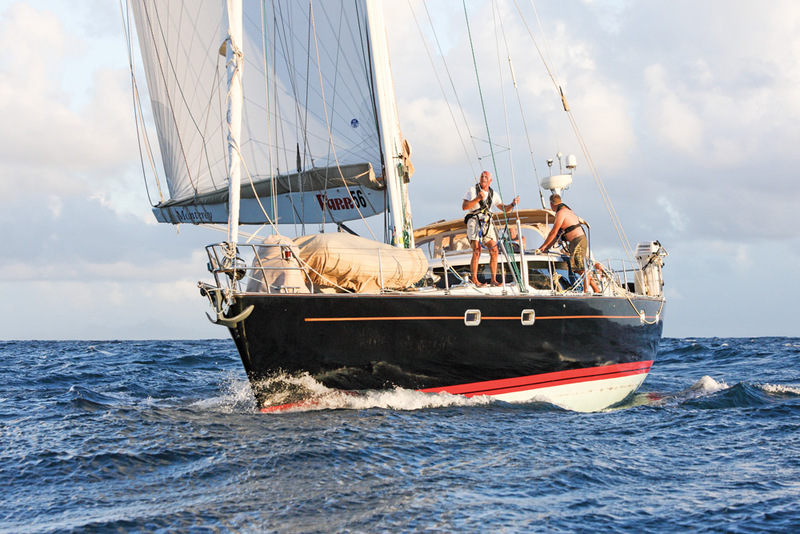 Dawn arrived as they floated and tried to digest the fact that a proven boat on which they’d recently sailed 5,000 miles from Greece to Antigua, one with a Kevlar GRP hull and in excellent condition, could so easily sink to the bottom. Monterey, as shown in the photo from last year’s ARC Challenge was a sturdy, well-maintained boat with more than 40,000 miles under her keel. Simon DuBois, watch leader at the time aboard Esprit de Corps IV, spotted a red light on the horizon, far too bright for a navigation signal. Charlotte Rousselot, another crewmember, noticed the shooting flares in the sky. She shouted and woke the other sailors sleeping below. Tristan Peloquin, a Canadian photojournalist with La Presse on assignment aboard Esprit de Corps IV to deliver a first-person story about the race, described the rescue in his blog. “When the first orange safety flare appeared in the sky, illuminating Esprit de Corps IV’s foredeck, the bearing to take was for once, very obvious. The whole crew immediately turned to rescue mode,” he wrote. 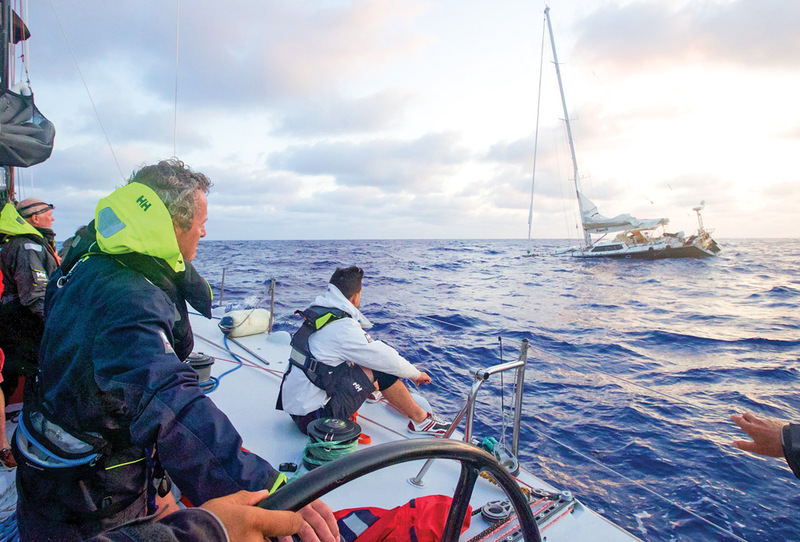 The engine roared as the 64-foot monohull raced toward the distressed vessel. “The first 20 minutes to destination were stressful as we were unable to establish radio communication. What were we to expect? A fire? A man overboard? Worse? And then, Les Crane’s calm voice crackled through the static on the radio. Monterey was taking on lots of water, but her six crewmen were okay,” Peloquin recalled. Barbot assigned each of his crew to a section of the boat. They were tethered to safety lines stretching from the foredeck to stern. All sails were doused and secured. Ropes and unneeded lines were stowed. A few fenders were positioned along the rails. The plan focused on bringing the survivors aboard from the stern. Lifelines were coiled and ready to toss. Medical kits, extra clothing and powerful spotlights were unpacked. “We relayed the mayday, even though we hadn’t actually heard a mayday over the radio yet, preventively based on the multiple flares we saw miles away,” Barbot explained. Barbot also monitored the Yellow Brick tracker. “The hourly report from the race helped to know exactly who was where. This is how they knew we weren’t far and we also knew who they were,” he said. From a distance of about two or three miles, Barbot finally made radio contact with Monterey. Once he knew the mission involved rescuing people from a life raft, he instructed his crew to watch for lines in the water, particularly the raft’s sea anchor, which he feared might tangle in his boat’s propeller. Barbot followed the “oxygen mask syndrome” that requires you protect your crew and boat first, especially the propulsion system, otherwise you become a danger to those being rescued. He equated it to flight attendants aboard commercial aircraft who review emergency procedures that advise adult passengers to don oxygen masks before assisting children or others. “With 12 to 15 knots of wind and two-meter waves, I decided to approach on the windward side to protect them from the wind and facilitate line throwing,” said Barbot, concerned about lines going under his boat if a throw was missed. One crewman was assigned to monitor the rapidly sinking boat’s condition in an effort to avoid contact with the mast should it suddenly swing or dramatically heel. By 7 a.m., the sailors were aboard Esprit de Corps IV where they were greeted with blankets and hot drinks. Spirit of Bermuda was standing by, Monterey was awash, the bow fully under water. For Crane, watching her sink was heart wrenching. “It’s very sad. Losing a boat is like losing a dog. It’s part of your life. You can’t just go out and replace it,” he said. Since the sinking there has been plenty of speculation about what caused it. Crane later learned from skipper Carlo Falcone, owner of the famed 1938 Bermudan yawl Mariella, about a large metal tank, partially submerged, which had been spotted along the race route in the area where Monterey was sunk. “Mariella was ahead of us. Carlo said it looked like a tank from a tractor trailer,” Crane said. The waters between Antigua and Bermuda are relatively remote, with the halfway point hundreds of miles from any land. As a result, rescue becomes more difficult. The route crosses over a northern portion of the Bermuda Triangle, also known as the Devil’s Triangle, where ships and planes have disappeared without explanation. Esprit de Corps IV went on to finish the race with Monterey’s sailors joining the crew. Crane even rotated into the watch schedule and accepted Barbot’s offer to take a turn at the helm, just hours after watching his own boat be swallowed by the Atlantic. “That was very gentlemanly of Gilles,” said Peloquin, who photographed Crane steering the boat while Barbot worked the grinder. Crane had planned to relax and watch some of the America’s Cup races with his family in Bermuda before sailing Monterey to Connecticut where his son was scheduled to refit the boat for the next Marion-Bermuda Race. Reflecting on the sinking of his boat Monterey, owner Les Crane drafted a list of mistakes made and recommendations about what he should have done differently. The summary will be presented at an upcoming Safety at Sea seminar hosted by the Cruising Club of America, he said. Here are some of those recommendations. Preferably two people on each team to monitor performance and ensure completion of all tasks including checking seacocks and bilge pumps; communication; reference AIS transponder for ships to contact for stand by; prepare satellite phone by pre-programming with primary and secondary contacts; EPIRB activation; prepare grab bags. Make a laminated chart using the boatbuilder’s lines drawing. Number and describe each seacock and any other through-hull above and below the waterline, highlighting those below the waterline. Make a list of numbered seacocks in large print and check off each as inspected to help determine location of water ingress. Test the primary VHF radio and antenna before leaving dock. Check handheld VHF radios. Use AIS to identify nearby vessels should you require help. Make certain the EPIRB and the satellite phone are registered and functioning. The AIS told Crane two boats were close behind him when the emergency occurred. The satellite phone allowed him to contact Bermuda authorities. At least one other boat in the race heard his radio mayday broadcast using a handheld radio. Monterey’s primary radio was not functioning properly upon leaving Antigua. Stock the boat with red handheld flares and parachute flares. Parachute flares have been deleted from Category 1 offshore racing regulations, Crane said, noting the decision was based on the mistaken belief that state-of-the-art electronics make them unnecessary. These waterproof satchels should contain passports, computers, phones, iPads and necessary medications, stowed inside a flare container. Gilles Barbot, skipper of Esprit de Corps IV, which rescued Monterey’s crew, was prepared with bright white searchlights for night rescue. He advised not aiming them directly at the life raft since it might temporarily blind the occupants. “Direct the light where you want them to look or to hang on,” he said. Drop your sails, control your speed and boat heading. Prepare to toss lines. Pay close attention to wind direction and waves. Don’t let the raft’s sea anchor foul your propeller.